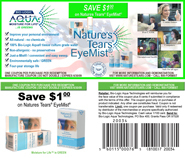 Natures Tears® EyeMist® - What is Nature's Tears EyeMist? What is Nature's Tears EyeMist? Nature's Tears EyeMist is not an eye drop! Safe, sterile and quickly applied. No dosage limit -- apply as often as desired. Additive Free: no preservatives or allergens. Compatible with all eye care products. Does not cause eye make-up to run.